At the suggestion of one of my friends from college, I decided to make a "cruncher" for liturgical art. My friend and her husband had showed me the Praise Song Cruncher some time back, and she thought it would be a great idea to do a similar one for the visual arts. I agreed, and made it my project for the day. 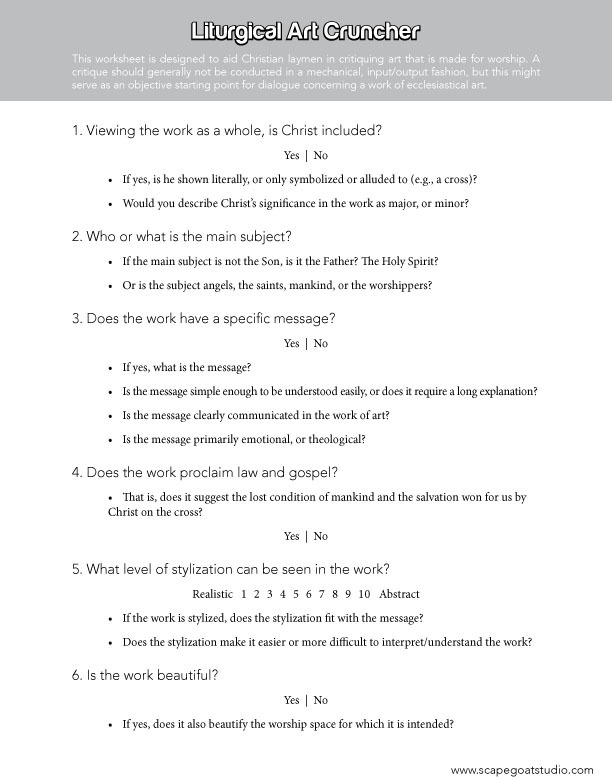 You can read or download the document here: Liturgical Art Cruncher. 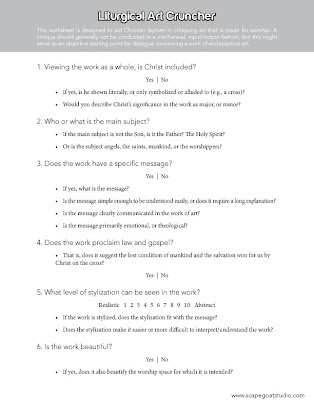 This worksheet is designed to aid Christian laymen in critiquing art that is made for worship. A critique should generally not be conducted in a mechanical, input/output fashion, but this might serve as an objective starting point for dialogue concerning a work of ecclesiastical art. Because works of visual art communicate in a less objective way than language, critique will always be somewhat subjective. The results of the cruncher may not be as straight-forward as you expect. The key is intended to help you weigh and interpret the results.